Simply put it’s 'Five Alive' meets 'Robocop' meets Gangster Hip-Hop all set in a bleak future JoBurg - which makes a nice change from the streets of LA. It’s not deep, it’s wears its plot on its sleeve and the script could have done with some character deepening – particularly for Sigourney Weaver, the CEO Bradley, Dev Patel, the Ai inventor Deon Wilson and Hugh Jackman (in a terrible hairdo) as baddie Vincent Moore, jealous of Deon’s success with his Robocops. That said, Chappie, a sentient Ai who used to be an accident prone Robocop keeping control of crime in JoBurg (300 murders a day – an underestimate I’d say) is taken over by ignorant posers Ninja and Yo-Landi Visser, the South African hip-hop duo essentially playing themselves as gangsters hiding out in an old power station. It’s kind of cute that it takes an opposite position on the threat of Ai (see the well crafted Ex Machina directed by Alex Garland) and is instead about a sentient machine socially maladjusted by these two low-lifes who just need a robocop to rob a cash truck to pay off a debt to an even bigger baddie. I guess it’s Bringing up Baby for a new generation and Chappie has a good soul in the care of Yo-Landi, his new Mummy. He develops fast and knows he mustn’t do bad, but he is being taught some very evil stuff and how to wound and main. 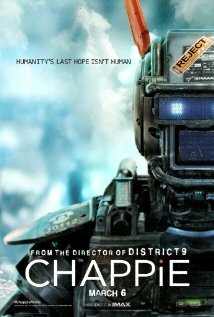 Chappie is quickly disillusioned about 'humanity' but has an indominatable spirit and keeps on returning home to the gangsters hide-out - no matter what happens to it. It’s great to see JoBurg as a backdrop and Blomkamp who gave us the wonderful District 9 has done his best to put you off ever going there. The special effects make Chappie seem more real than the human actors and I guess that was the plan. The soundtrack by Hans Zimmer and Die Antwoord is fun and very energetic and will either alienate those who like their sci-fi with full orchestra or thrill those who like to hear something edgy. I seem to be missing some action scenes that were in the trailer – but no matter and downloading your mind is achieved somewhat faster than in that turkey ‘Transcendance’ that Johhny Depp served us last year. In fact becoming Ai seems quite handy. It might even catch on one day and we can all live forever. In a way this is a fast action kids film with a good moral message – pity the language might deny entry to those who would most enjoy it. Chappie is fresh and exhilerating – go see.